We had read much about the former capital of Myanmar, none of which was very positive. But as the source of a poem, songs and the start of the book ‘Rebecca’ I was keen to see the city that had once generated so much interest. It was definitely worth the effort. The city itself is chaotic, it doesn’t really seem like a city as such, more like a town. But they do say you will see the true Myanmar culture here and I feel like it definitely was a richer cultural experience than Yangon. We arrived early and headed straight to our hotel – the Hotel on the Red Canal. The hotel was a beautiful oasis in the hot, dusty city. But the Red Canal was really not worth a mention – it was more like a drain in the middle of the road! Still the hot towels and juice on arrival soon made us overlook the canal. And despite the fact we arrived before 10am, they checked us in, apologised for not having our room ready and gave us a free coffee – unfortunately neither of us drink coffee but it was such a nice gesture I didn’t have the heart not to drink it. Our room was beautiful, very relaxing. But we weren’t there to stay in the room; the sites of Mandalay were waiting. We wandered over to Mandalay Fort and Palace with the intention of hailing a taxi. The Fort is massive, the walls stretch on seemingly forever (in reality about two kilometres on each side) and are reflected in the surrounding moat. We hadn’t planned to, but when we got there we couldn’t resist looking around the Fort and I’m glad we took the time. Much of the fort grounds are used by the military and are out of bounds to tourists, but they have rebuilt parts of the old palace and surrounding houses. 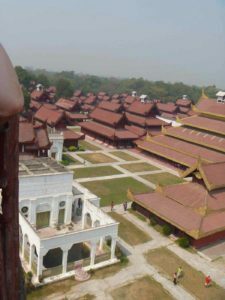 The Palace dates back to 1857 and was apparently the Royal Palace of the last Burmese Monarchy. The buildings are all crafted in teak and each of the homes mirror the next. 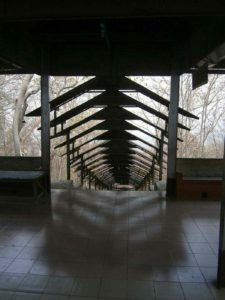 All are empty, so really there is no need to walk through every one – tempting though it may be! It’s worth climbing up the lookout for a view out over the grounds and palace, but the narrow and rickety staircase may not appeal to those that don’t like heights (Sam found the going tough on the way up, and was almost just as nervous heading down!). We thought it would be easier to flag down a taxi from here, and while we managed to do so, it wasn’t quite as easy as we had thought. 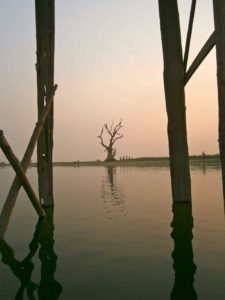 But after 20 minutes of negotiating with a local drink cart owner, a taxi driver had arrived and we had agreed a price for a trip to U Bein Bridge and Sagaing Hill – $20 for the afternoon. Our driver spoke more than passable English, and was more tour guide than taxi driver, so while we had asked to be taken to the two sites, we got so much more. 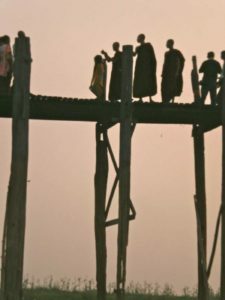 Our first stop was the gold pounding district in the heart of Mandalay, where we watched well-built men pound and pound gold, turning it from gold pieces into gold leaf. The gold leaf is sold in packets at Buddha sites all around the country – apparently if you put the leaf onto an area of Buddha’s body that is troubling you, it will be fixed. From here we went on to Mahamuni Paya to see the seated Buddha. The temple was amazing, and the Buddha was very impressive – it was covered with layers and layers of gold. Unfortunately only men are allowed to put the gold leaf on this particular statue, a little odd as both Sam and I had done this at the Shwedagon so I’m not sure why women weren’t allowed to do so here. Our next stop was the marble polishing district and an iron-casting place. All of which were very interesting, but we really wanted to get to the temples at Sagaing. The drive out was beautiful, along something of a ‘lover’s lane’ with loveseats dotted along the roadside, all of them occupied by couples enjoying the scenery. 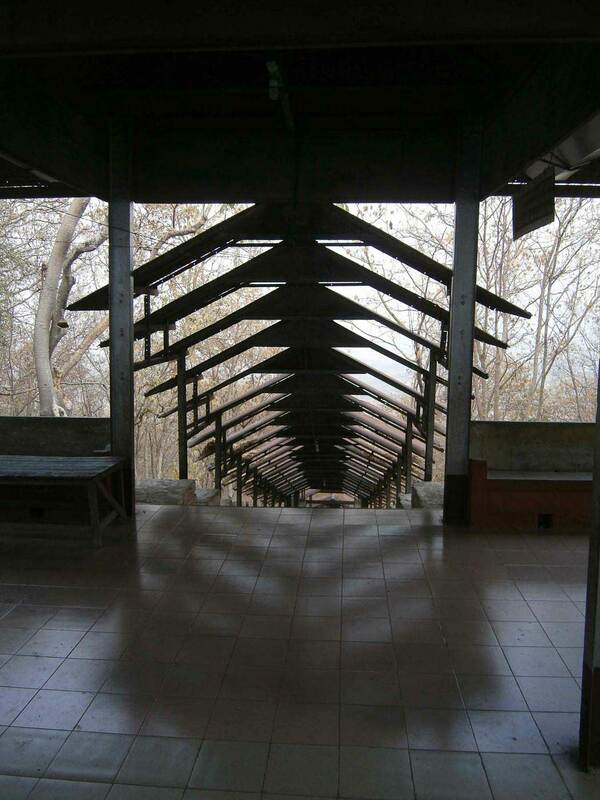 Sagaing Hill was breathtaking – pagodas dotted through the mountainside. Our driver knew when to stop for us to take photos, took us to the Buddhist Monk University then a primary school where we met children who would grow up to become monks and nuns. The children were so happy and delighted in having their photos taken. But they were crowded into classrooms and some of them were falling asleep as the teacher tried to teach them. It was also somewhat of a surprise to see all the children – girls and boys – with their heads shaved. Many of the children in the school are orphans and others came from very poor families. The driver told us the children would not eat dinner and would not eat until 5am the following morning; they must have been starving (although sometimes the teachers would sneak food to the youngest children). We left a donation and headed up to Sun U Ponya Shin Paya, built in 1312. Sun U Ponya Shin Paya is one of the most important shrines at Sagaing Hill. The shrine is covered in glass tiles giving it an interesting shimmer. The hillside is covered in seemingly hundreds of pagodas and temples, most of which are topped with gold leaf spires. With more time you could walk the path that criss-crosses the hill, taking you past the major shrines. Alas, we were on a tight schedule so almost had to run through the Sun U Ponya Shin Paya to ensure we saw it all, before moving on. 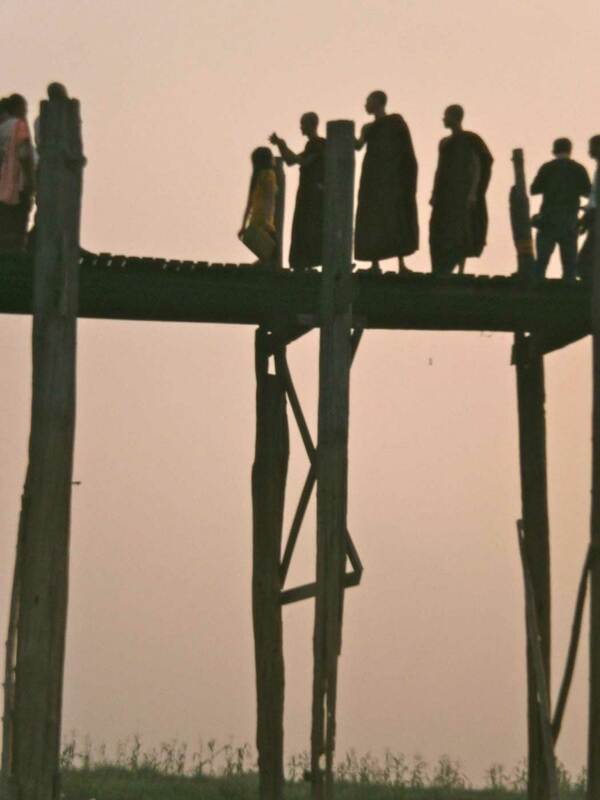 Our driver was insistent that we needed to get to U Bein Bridge for sunset. 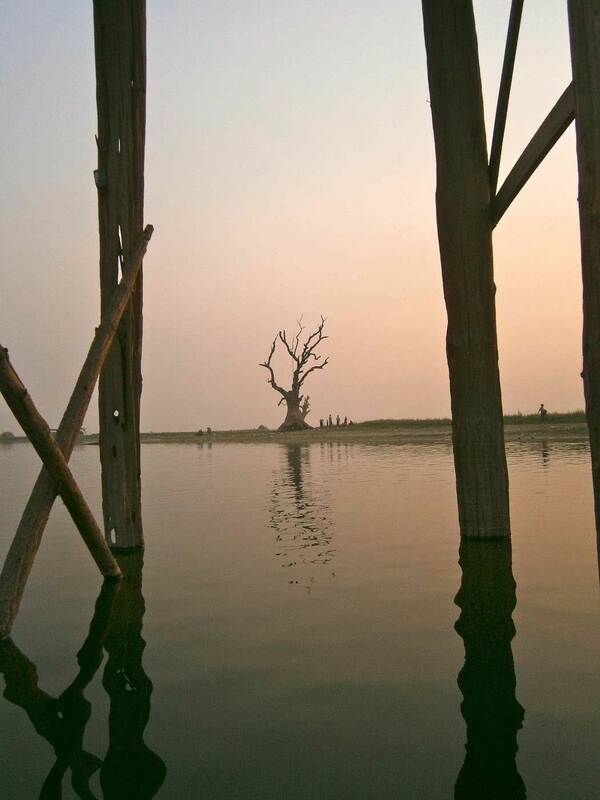 The bridge is 1.2km long; it crosses Taungthaman Lake and is very rickety! 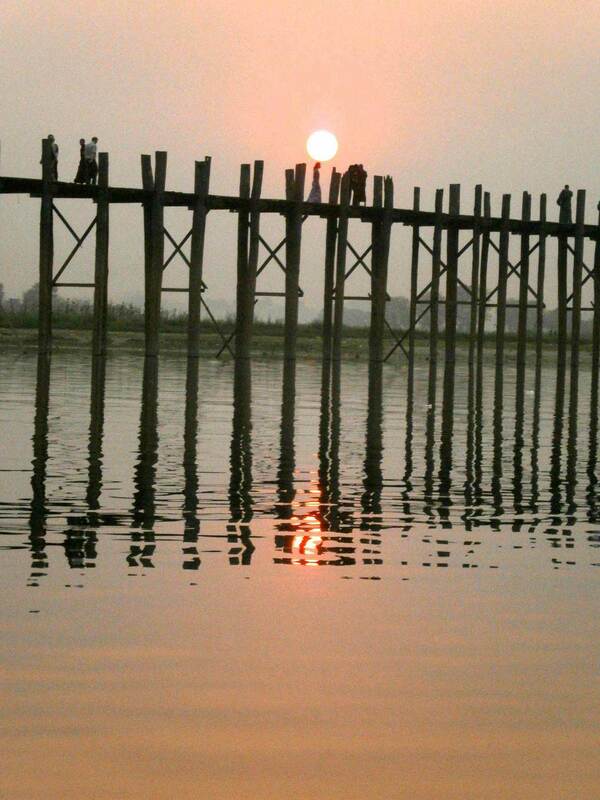 It was built from teakwood in 1850 and is believed to be the oldest, longest teakwood bridge in the world. Evidently the tourist thing to do is take a boat out and watch the sunset, then walk back across the bridge. Our boat driver was a kid in grade six at school, but he was excellent and chatted to us along the way. We got off the boat, which is actually kind of like a gondola, half way along the bridge and walked back. The bridge is a footbridge and looks like it may fall down any minute. Hundreds of tourists were crossing the bridge, which made me wonder how much longer the bridge could withstand that much traffic. But the experience is quite magical. By the time we got back to our hotel at 7pm we were exhausted – hot , sweaty and tired. But waiting at the entrance of the hotel were staff members with cold wet face washers – a very welcome return. It’s just a shame we missed cocktail hour! We had arranged for the taxi driver to pick us up again the next morning to take us to the docks in time to catch a boat to Mingon. We made it with time to spare so we chatted to the locals. 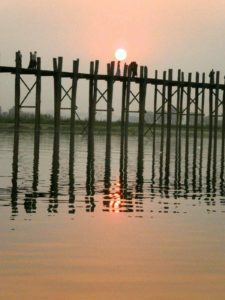 We took the slow boat to Mingon, which is famous for the partial building of a giant pagoda. In truth only the base was finished and even this has since been damaged in earthquakes, but it is a lovely place to visit for the morning. If it had been finished, the pagoda would have been the largest in the world. Unfortunately the king died before it was finished and so it remains incomplete. As the boat full of tourists pulled up, the ‘taxi drivers’ lined the riverbank trying to attract attention. The taxis were actually carts pulled by cows. Of course Sam and I picked ours out straight away. We got off the boat and were immediately accosted by girls selling hats, jewellery, umbrellas… We were a soft target and had to force ourselves to move on to ensure we actually saw some of the sights of Mingon and didn’t just spend all our time shopping. Somehow, in trying to negotiate the taxi and the shopping we had ended up with a young tour guide, we thought he came with the taxi, but evidently not. He spoke excellent English and knew a lot about the area. We ended up paying him far too much, but he was very good and very funny. The town is also known for its large bell – the second largest in the world and the largest non-cracked hanging bell. We stood inside it while our guide rang it – fortunately it wasn’t as loud as we had expected it to be, and then went to see the temple built for the Queen. The Queen’s Temple looks like a maze from a distance. Sometime way back when the temple had been raided and the perpetrators had pulled the head off the original Buddha looking for gold (it’s actually buried underground according to our guide). They tried to put the head back on, but it was too low, so they put another Buddha in front instead. The two Buddhas still sit there, one behind the other. After a quick swim back at the hotel in our gorgeous swimming pool, our driver picked us up at 4 to take us up to Mandalay Hill where there are meant to be stunning sunsets over Mandalay. But our driver suggested that instead of watching the sunset, we could go to a Monastery to listen to the Monks chanting. Of course, we decided to do both! On our way we took a quick detour to the World’s Biggest Book, 729 pages inscribed into marble, each housed in its own temple. The book tells of the enlightenment. 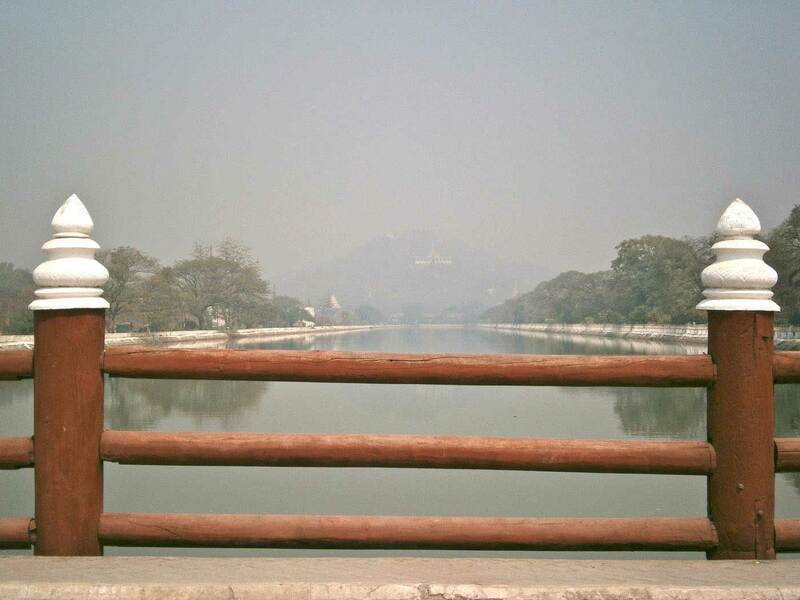 We didn’t have time to walk up all the steps leading up Mandalay Hill so our driver dropped us off near the top. Once again we passed a range of trinket stalls all along the steps. 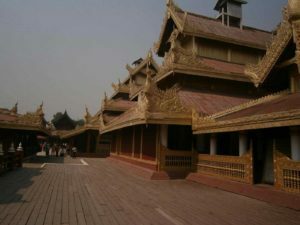 The top of Mandalay Hill is a series of temples and a labyrinth of marble, stone and glass. Just as we thought we were at the top, we would see yet another staircase and another arrow leading us ever higher. We thought we were at the top when we reached a large tin shed with yet another temple inside and really, we couldn’t see what all the fuss was about. But then we kept walking, past more stalls and up more steps. Once you actually reach the top, it is quite remarkable; a kind of glass and mirror temple. Unfortunately the air was very hazy so the sunset wasn’t particularly good for the hundreds of tourists crowding the temple to watch. We had a very quick look around and then ran down to try and get to the monastery in time to see the monks. The Monastery was beautiful and I had expected there to be hundreds of tourists here also, but there was only one other couple with a guide. We watched as the Monks walked out in line, chanting all the way – the little one at the back couldn’t quite get his robes sorted so was busy trying to tidy himself up the whole time! While they filed into the temple to pray we toured the stunning library before sneaking a quick look at the Monks praying through the open windows of the temple. Mandalay certainly hadn’t disappointed us!